The House on Tuesday failed to override President Donald Trump’s veto of a resolution that would have terminated his declaration of a national emergency at the southern U.S. border, leaving the matter to federal courts where several lawsuits challenging the decision have been filed. A veto override requires two-thirds support, and the House vote fell short, 248-181. Only 14 Republicans voted with their Democratic counterparts to override the veto. Trump plans to use the national emergency as justification to transfer $3.6 billion in military construction funds to projects expanding physical barriers along the southern U.S. border. 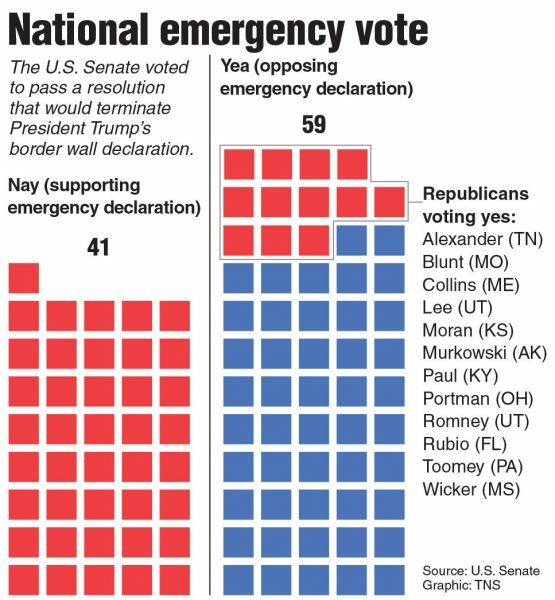 Most Republicans, despite concerns about the separate powers of the legislative and executive branches, supported the president’s emergency declaration. Last month, the House passed the resolution, sponsored by Texas Rep. Joaquin Castro, to terminate the national emergency. That vote was 245-182, with 13 Republicans joining Democrats in support of termination. The Senate was forced to take up the resolution because of its privileged status, and it passed, 59-41, with 12 Republicans joining Democrats in support. The Senate vote was considered a more significant rebuke of the president, because nearly a quarter of the Republican Conference supported the termination resolution. The veto override was never expected to be successful, but Democrats still wanted to take the vote to continue hammering home their point that it is Congress, not the president, controlling the power of the purse. House Majority Leader Steny Hoyer told reporters Tuesday before the vote that he hoped Republicans would pretend Barack Obama was still president, and consider how they’d vote in that context. With the legislative effort to stop Trump’s national emergency now officially dead, the declaration’s fate will be decided in court. Several states, led by California, have joined together to file a lawsuit challenging the national emergency. The city of El Paso, one of the towns located along the border where Trump wants to build additional barriers, has filed its own suit, as have a handful of outside groups. Democratic Caucus Chairman Hakeem Jeffries during a press conference Tuesday morning declined to say whether the House would get involved in any of the legal challenges if the override vote failed. “We’re focused right now on seeing what happens on the floor, and then collectively the leadership will decide how we proceed from there,” the New York Democrat said.